SM Duty Free (Seoul Store) houses 490 brands and more than 60,000 products including premium luxury brands and K-Culture products to attract domestic and international travellers. The building offers Hallyu-related goods at Korea Drama Mall and drama filming set, K-Cosmetic Zone and K-Baby Item Zone. Hallyu experience hall is available on the 5th floor for foreign visitors. The value of the discount is in Korean Won. Only available for free individual traveller. One discount coupon is redeemable in a single transaction. Discounted amount is not subjected to free gifts. 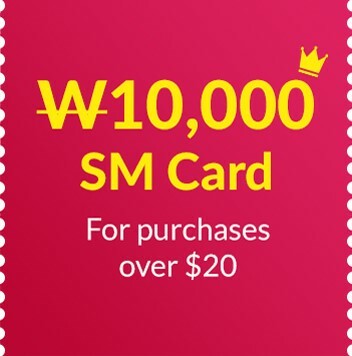 The discount coupon cannot be used concurrently with SM Card. The discount coupon is not applicable to selected items, e.g. (tobacco, alcoholic beverages and items discounted for over 30%). Discount coupon cannot be refunded or re-issued when cancelling purchase once it has been redeemed. SM Card is available for free individual traveller (foreign tourist) above 14 years old only. Each passport holder is entitled to one SM Card and must collect the coupon personally. Please check with the staff if you met the tax exemption requirements. SM Card and discount coupon cannot be exchanged for cash and strictly no resale. SM Duty Free reserves the right to amend the Terms and Conditions stated at any point. Please refer to the coupon for more Terms and Conditions. Please present your passport to redeem the SM Card at SM Duty Free (Seoul Store) 1F Information Desk. Please present your passport and coupon to enjoy the discount and tax exemption at the cashier's desk upon making payment. Changi Travel Services Pte Ltd shall not be responsible for the quality, merchantability or the fitness for any purpose or any other aspect of the products and/or services provided by third parties and Changi Travel Services Pte Ltd shall not at any time be responsible or held liable for any loss, injury, damage or harm suffered by or in connection with the products and/or services provided by third parties. All disputes about the quality or performance of the product and/or services shall be resolved directly with SM Duty Free. In case of any disputes, Changi Travel Services Pte Ltd is entitled, in its absolute discretion, to make the final decision. Changi Travel Services Pte Ltd will not be liable for any inconvenience, loss or damages arising from this dispute. Changi Travel Services reserve the right to terminate this promotion at any point.